The perfect all around road rim (hard anodized). At 470 grams, this rim has proven to be light yet not sacrificing strength, stiffness, and stability. 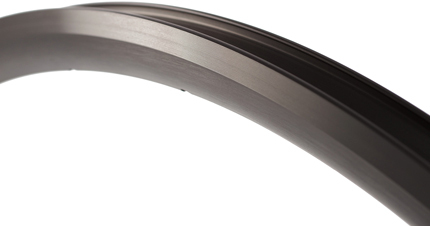 The well accepted 23mm wide profile mimics a tubular tire in both comfort and ride quality. The advantage can be felt immediately while taking corners as the tire is no longer shaped as a light bulb, flopping over with high load. H Plus Son's impeccable workmanship and their invisible welded rim joint comes standard with each rim. Please Note: Due to the separate anodizing process on each spoke count version during manufacturing, there may be very slight differences in color shade between the 20, 24, 28 and 32H versions.